Essentially, this album finds Booze Control back with another platter of traditional heavy metal in the NWoBHM tradition. The quartet brings the usual musical suspects into play: twin guitar harmony in crisp riffs, an abundance of guitar solos, lively gallop and groove in the rhythm section, and clean rather subdued vocals. 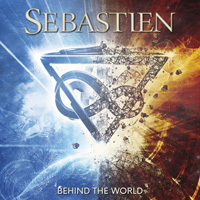 Of all these things, I found the guitar solos exceptional and the bass line, a thriving and driving force. As for the songs, again, they're what you'd expect from Booze Control. 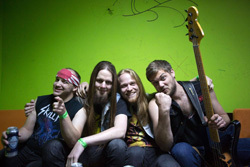 You'll find the band leaning more to the speed power metal side with Forgotten Lands and Slaying Mantis. With Attack Of The Axemen and Thanatos, Booze Control offers a sharp guitar start before dropping into some classic metal with some modest gallop. Spellbound has a strong drum entrance, then delivers heavy metal with some rock groove where the bass line rises. With Cydonian Sands the band constructs an epic anthem by lacing several acoustic guitar parts into their steady, rising heavy metal which also bristles with several fine solos. Basically, Forgotten Lands finds Booze Control creating well-crafted and entertaining traditional heavy metal. They know their genre well, and simply do not disappoint. Recommended. 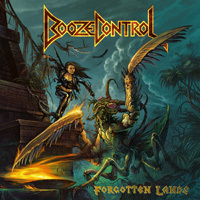 Forgotten Lands finds Booze Control creating well-crafted and entertaining traditional heavy metal. They know their genre well, and simply do not disappoint. Recommended.